BRAVE NEW WORLDS The TESS exoplanet telescope's first science image includes this snapshot of the southern sky, plus three more taken with TESS's other three cameras. The Large Magellanic Cloud, a small galaxy that orbits the Milky Way, is on the image's right. The star R Doradus is so bright it left a spike of light streaking across the image. The next exoplanet hunt is officially on. 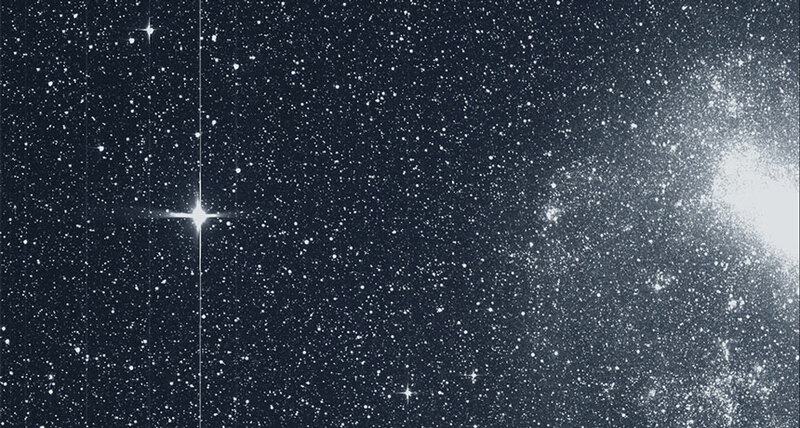 NASA's Transiting Exoplanet Survey Satellite (TESS), which launched in April (SN: 5/12/18, p. 7), has taken its first wide-sky science image and has confirmed its first exoplanet. The "first light" image (the moniker for a new telescope's first useful image), taken August 7 with all four of the telescope's cameras and released September 17, shows a field of stars and two of the Milky Way's satellite galaxies, the Large and Small Magellanic Clouds. A few of the stars are so bright they saturated the telescope's light detector, creating streaks of light across the whole image. TESS spotted the new planet, called Pi Men c, crossing in front of its bright sunlike star 60 light-years from Earth and blocking a bit of the starlight, data collected from July 25 to August 22 show. That transit revealed that the planet is 2.14 times Earth's radius and orbits its star every 6.27 days, the TESS team reports September 18 at arXiv.org. The researchers found previously unnoticed evidence of the planet in data from the HARPS spectrograph and the Anglo-Australian Planet Search, which have monitored the star, Pi Mensae, over the past 20 years. Those observations show how the planet's gravity tugs on the star, letting researchers determine that the planet's mass is about 4.8 times Earth's. Those telescopes had previously revealed another planet, this one 10 times the mass of Jupiter, orbiting Pi Mensae every 5.7 years. Combining the newfound planet's mass and radius shows it has a similar density to pure water, "though of course we should not imagine the planet to be a globe of water," the TESS team writes. Instead, it probably has a core made of iron and rock, surrounded by an ocean or atmosphere of lighter materials like water, methane, hydrogen and helium.